The Brandenburg Gate (Brandenburger Tor) is to many the very symbol of Berlin. Originally part of Berlin’s Customs Walls, (a testament to Germany’s love of taxes) the Brandenburg Gate was built around 1780s and was on the outskirts of the city but today the Brandenburg Gate is located at the very center of Berlin. You can find it on Pariser Platz, just minutes walk from the Siegesaule, Jewish Memorial, Reichstag, Tiergarten and some of the larger embassies. Victoria, the Roman winged goddess of victory driving a chariot pulled by four horses sits atop the gate. This arrangement is called a quadriga and can be found all across the world, most notably at St Marks. Interestingly enough, after Napoleon defeated the Prussians at the Battle of Jena in 1806, he took it back to Paris with him. But the quadriga was returned to Berlin in 1814 after the Prussians returned the favor by occupying Paris towards the end of the Napoleonic Wars. In 1945, during the Battle of Berlin which brought the war in Europe to an end, this central area saw some of the heaviest fighting of the entire war. Amazingly the Brandenburg Gate survived. Since then it has held an important place international politics. The Berlin Wall ran directly in front of the Gate, isolating the it from West Germany. Later, in 1987, President Reagan gave his famous “Mr Gorbachev Tear down this wall“ speech and President Bill Clinton spoke there as well in 1994. 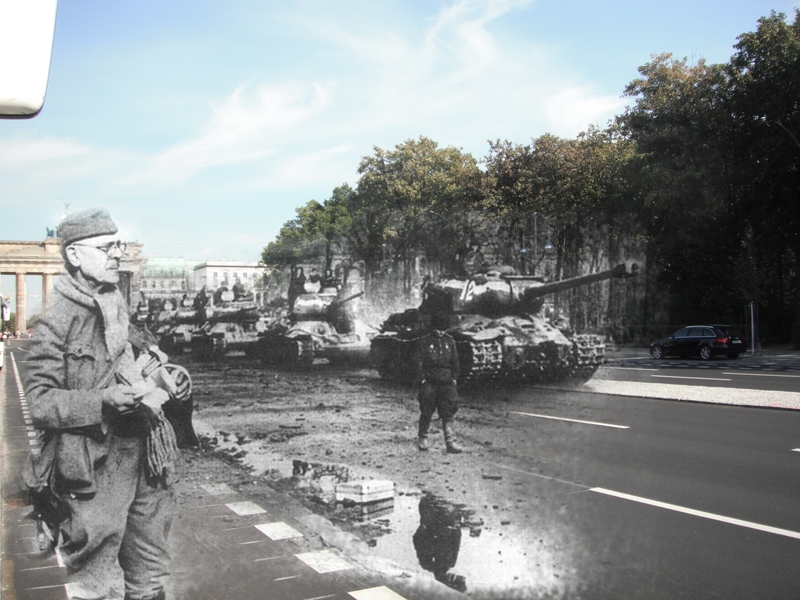 A smashed Tiger 1 near the Brandenburg Gate. This was the picture that started this project. This first picture, was the photograph that inspired me to work on this project. 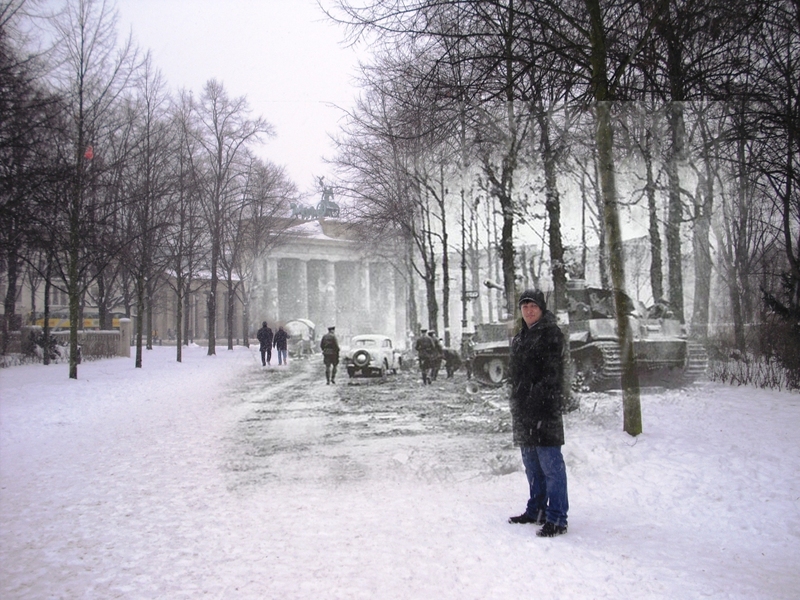 I took it a few days after arriving to Berlin on a cold February day in 2010. I hope you can enjoy these photos as much as I did making them. 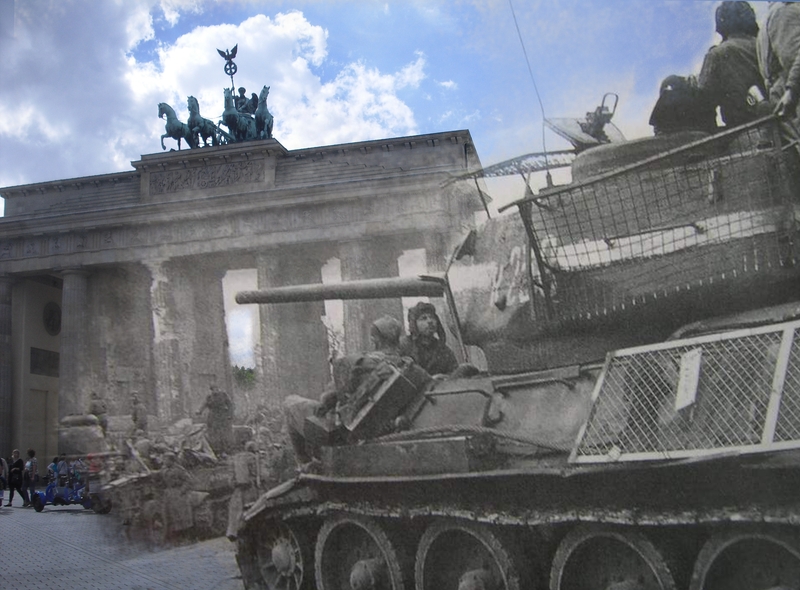 Here, after the Battle of Berlin has ended, you see what appears to be a disabled German Tiger I tank and just beyond it, the Brandenburg Gate. According the German Archives, this is a field hospital for wounded soldiers. Nurses mill around as a medic dispenses what little medical attention that was available at the time. In all, some 100,000 German soldiers died defending their capital. You can add another 22,000 civilians to that number (or 100,000 depending on how you like to count). Today, the areas is full of tourist and constantly under heavy construction. In the last two years of the war, the Allied dropped some 65,000 tons of bombs on Berlin. In 2012, undetonated bombs are still being found. Authorities estimate as many as 3,000 bombs still lay buried under the streets of Berlin. If the Allies dropped 565,000 tons of bombs on Berlin in two years, the Soviets sent 40,000 tons of explosives into Berlin in the two weeks preceding the Battle of Berlin. This photo is perhaps of the same field hospital shown above. To the left of the photo you have the Kunst Academy and the US Embassy. 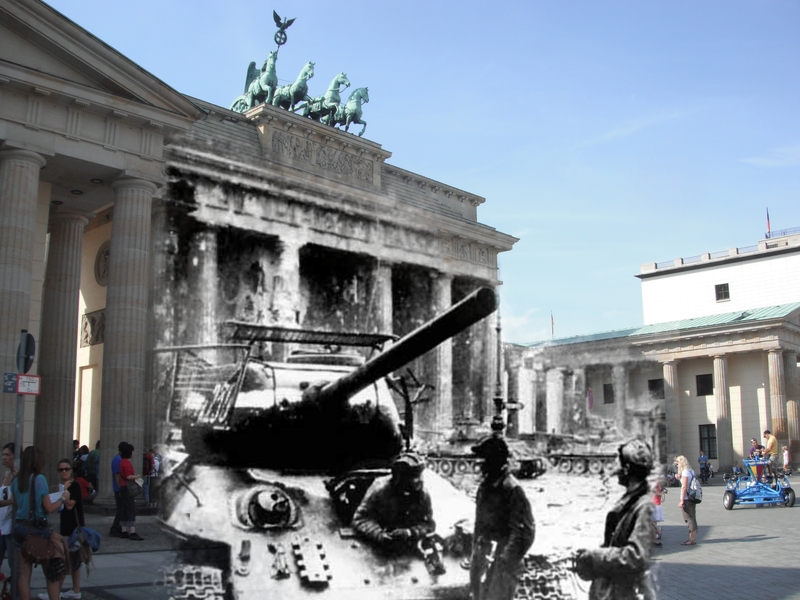 Both closed long before the Battle of Berlin began. 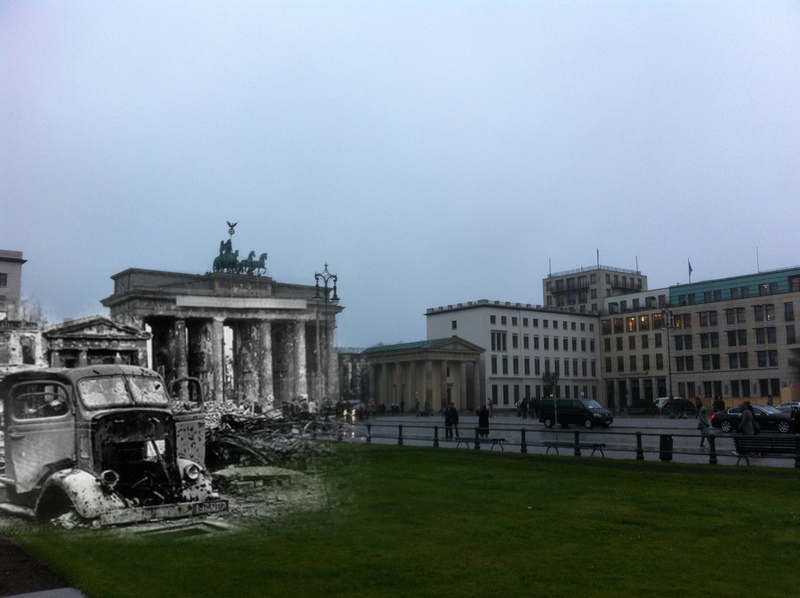 Here a truck lies ruined in front of the Brandenburg Gate. In a war filled with worst-case-scenarios, the Battle of Berlin was exceptionally harsh. The gloves had come off years before, but the ferocity of fighting saw few parallels. I walk the very streets that were a literally a battleground two generations ago. I work about 100 yards from where the Reich Chancellory was, its difficult to conceive with any accuracy what violence occurred just in sight of the window I look out of daily. When the Red Army descended upon the German capital for the Battle of Berlin, the outcome was never in question. As the story goes, the Soviet army consisted largely of peasants, many of which had lived their whole lives on collective farms. They had never seen a city like Berlin before. Astounded by the technology, stories exist of some of the soldiers removing the lightbulbs and shipping them back to their villages, unaware that they required electricity to run. Here, a T-34 tank crew, just three of the two and a half million Red Army soldiers, chat in the shadow of the Brandenburg Gate. The Panzerfaust (armored fist) was the German Army’s answer to the T-34, this cheap, easy to use and extremely effective anti-tank weapon was distributed widely to Berliners before the Battle of Berlin. Berlin defenders learned quickly that the Soviet tanks could not raise their guns high enough to hit a building’s upper stories, so they learned to attack from above with the Panzerfaust. At the same time, the narrow, rubble-choked streets also made the lumbering Soviet tanks easy targets. Urban warfare has always put the advantage to the defender, making a tank easy prey to an ambush. As a result, Red Army tank crews commandeered steel mattress springs and welded them to the sides of their tanks. These structures served as rudimentary anti-armor armor, detonating Panzerfaust shells inched before the hitting the hulls of the tanks. The concept is still in use in many modern militaries. 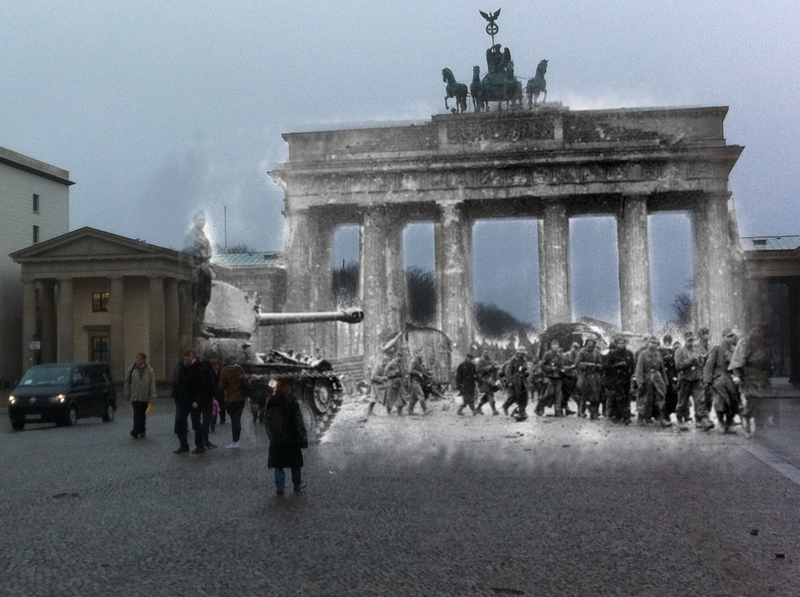 Here German Prisoners of War are marched past the Brandenburg Gate. 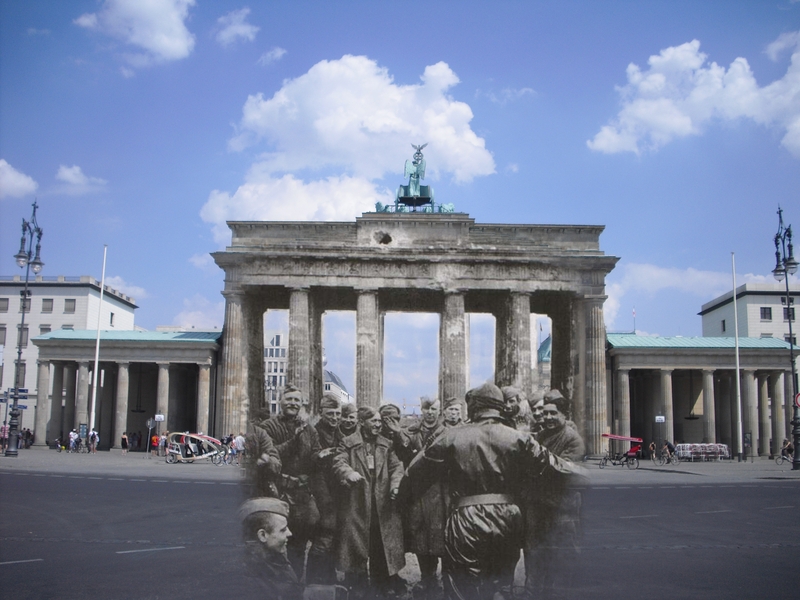 Following the Battle of Berlin specifically, the Red Army rounded up any man in a uniform and marched them East. That isn’t any in a military uniform, its anyone in a uniform, fireman, rail workers, postal carriers, police officers….180,000 from Berlin alone. Nearly all went to hellish condition in Russian mines, factories, farms or camps. Few ever returned. I find it particularly saddening that, even after the war ends, the suffering did not. According to some estimates, in 1945 alone 600,000 Germans were shipped to Russia to be used as labor, half lived. I’d like to think that after such a horrific war ended, folks would be quick to end the suffering. But, I suppose that’s not the way it works. Happy to be alive, these Red Army soldiers dance for joy in front of the Brandenburg gate. And, well, who the hell can blame them? Heres a video of some traditional Russian dancing. The Nazis pressed some 400,000 elderly men, children and infirm into service in preparation of the Battle of Berlin. Known as the Volkssturm, (people’s storm or people’s army), many fought bravely but were obviously largely ineffective militarily. Here an aged Volkssturm soldier watches a column of victorious Red Army soldiers and Josef Stalin tanks march through his nation’s capital. This man looks about sixty, so he probably fought in both World Wars. I imagine losing never gets easier. Regardless, another who’s luck seems to have carried him through the war with life intact. 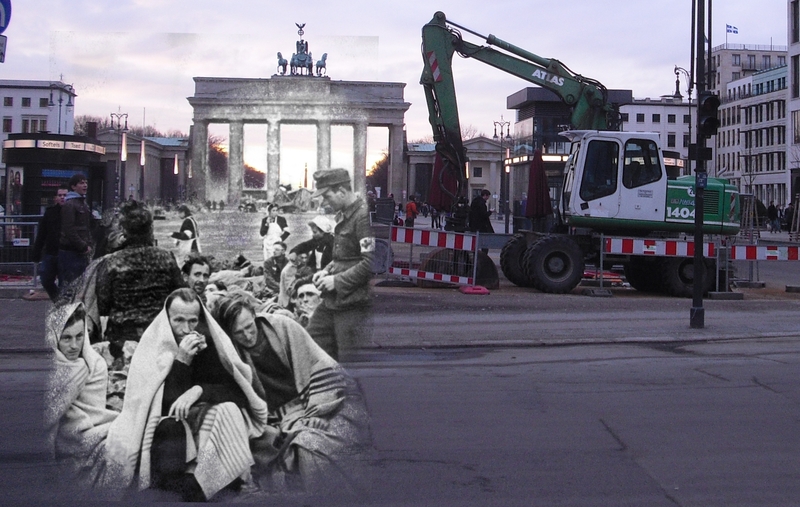 After the Battle of Berlin ended, the nation was in economic ruins. 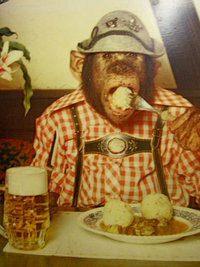 Rations, restrictions were universal and luxuries non-exixtant. The UK did not go off od rationing until 1954, nearly ten years after the war! Gate became an epicenter of the black market. With basic services gone, supplies non-existent and money worthless, a barter economy emerged, one which the Allied soldiers took advantage of. 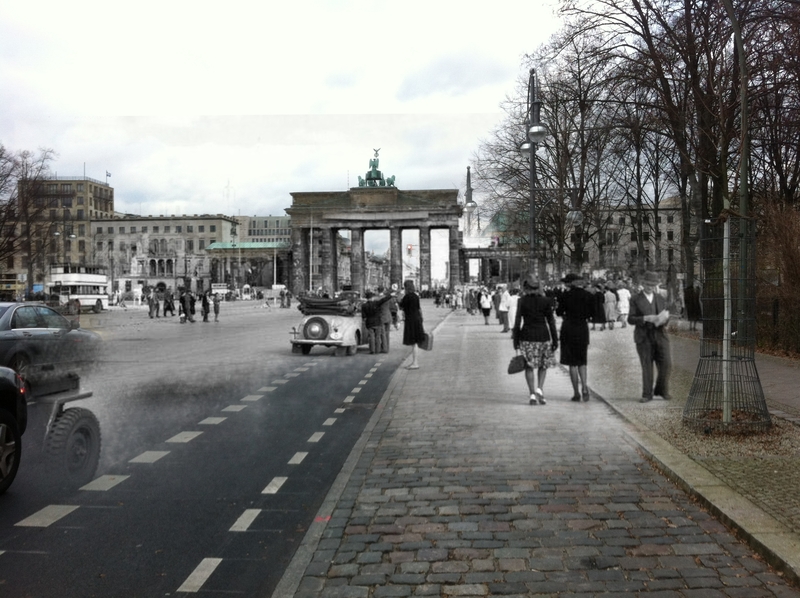 Here is an excellent article talking about postwar Berlin.